If you have ever had the desire to play golf in two states on the same day, Farmstead Golf Links allows you to do that in the same round and on the same hole. This is one of the unique things that this Willard Byrd design offers. The 767 yard, par 6, 18th hole that starts in South Carolina and ends in North Carolina gives every Farmstead player something to go home and tell his buddies about. The uniqueness of Farmstead does not end there as it offers a wonderful Myrtle Beach golf experience with its fairways winding through native coastal grasses and sparkling lakes. The natural terrain offers outstanding views of the lowcountry. Farmstead Golf Links is located only a short drive from North Myrtle Beach on the North Carolina border. The convenient location makes it easy to enjoy the wonderful golf course, beautiful Myrtle Beach clubhouse and practice facility. If you are looking to improve your golf game you can easily do that with a Myrtle Beach golf lesson from the Farmstead professional staff. 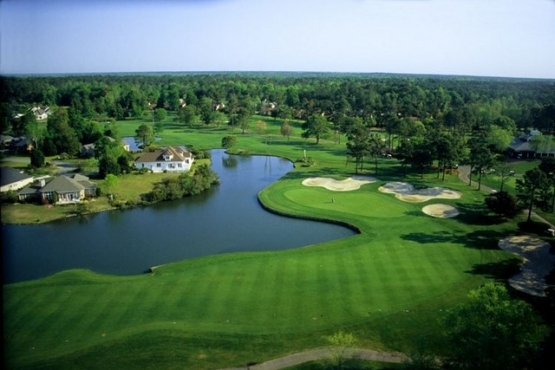 Farmstead Golf Club also offers a serene setting, allowing everyone to enjoy the beautiful Myrtle Beach weather. When planning your next South Carolina golf vacation, Farmstead Golf Links would be the perfect Myrtle Beach golf course to include with any of the outstanding North Myrtle Beach golf courses for the perfect Myrtle Beach golf experience. Book your Myrtle Beach golf package today! Loved this course. Unique to us that we could tee off in one state and putt in another! Got rained out with lightning on the 7th hole but back on again when it cleared in a very efficient manner. Loved the par 6. Best low cost course, interesting hole layouts, good risk/rewards chances, good quality greens.